John Campbell, from Scotland, Nathan Vance from Wisconsin, Willis Thomson and James Campbell were the first settlers in then Hamilton, now Money Creek Township in 1853. Other early settlers were: Bates, Williams, Thurbers, Sinclair, Robinson, Stewart, Thompson, Berry, Wilson, Goodrich. The township of Money Creek is located in the northwestern corner of Houston County, bordered by Winona County on the north, Houston Township on the east, Houston and Yucatan townships on the south, Yucatan Township and Fillmore County on the west. It is eight miles long from east to west and five miles wide, containing about 35 square miles. Root River is the line on the south of Money Creek Township. The first town meeting was held at the house of Enoch Gould, May 11, 1858. E. D. Northrop, chairman, C. B. Sinclair, clerk; 37 voters unanimously elected; supervisors: C. P. Gates, chairman; Charles Gyle; C. Anderson; clerk, C. G. Berry, assessor; N. Wittmore, collector; H. Mills, Overseer of the poor, Enouch Gould; constables, H. Mills and Stephen Van Horn; Justices of the Peace; Charles Smith and E. D. Northrop. In 1882, Money Creek had the finest two room school in the county and the post office was located in Emery's store. A meeting was held in July 1902, in Money Creek, at which time it was decided to build a creamery on the E. J. Kingsley farm, the site of the old Red Schoolhouse. Its first officers were: President, M. Gallagher; Treasurer, Charles Rank; Secretary, H. T. Brann; Directors, D. A. Tiffany, E. J. Kingsley, Wm. Gordon. The Money Creek Creamery finally consolidated with the Houston Creamery in December 1951. The following have operated the in the village or township: Post office, doctors, stores, machinery dealer, saw and feed mills, taverns, a dance pavillion, a Baptist Church, blacksmiths, garages, tannery, wagon shop, gun shop, hotels, a race track, Woodman Lodge, dress maker, stockyard, filling station, shoe shop, nurseries, creamery, stage coaches, ferry, tonsorial artist, dentist as well as Cornet Band and a Baseball Club. The ball players had uniforms with Money Creek printed on them. When the creamery and school closed, the village also lost its stores. At present time (1982) there is a manufacturing business in the school building using man-made materials. Money Creek Haven, a campground located at the foot of Vinegar Hill, is active. It was opened in 1962 by Fitting brothers, Ralph, Roland and Allen. Brian Forsyth has a sign painting shop in the village. Roger and Shirley Johnson have an antique shop at the foot of Paradise Valley. Marilyn (Mrs. Richard) Torgeson has a craft shop. Kenneth Konkel conducts a repair shop for farm machinery and cars along Highway 76, mid-way between Money Creek and Houston. Vern and Alice Stelplugh opened their museum in the village, in 1971. So called progress has stymied business growth, in the village. Eugene Berry drove a team and wagon for the first school bus from Campbell Valley to the two room school in the village of Money Creek. Now motor vehicles transport the school children in the township, to either schools in Houston or Rushford. Mrs. Carl Ask and Mrs. Paul Baumgartner were the last teachers in the two room Money Creek School in 1969-70. The 1982 members of the Money Creek Town Board are: Art Wheaten, Clerk, Richard Nelson, treasurer; chairperson, Lawrence Laumb; supervisors; Charles Chapel and Max Benson. The C. M. & St. Paul Railroad, ran parallel with the Root River. There was a shelter by the track between Houston and Rushford known as Money Creek Station. Due to confusion with the village of Money Creek, the name was changed to Perkins, in honor of some railroad men from this township. This was a flag stop with no agent. 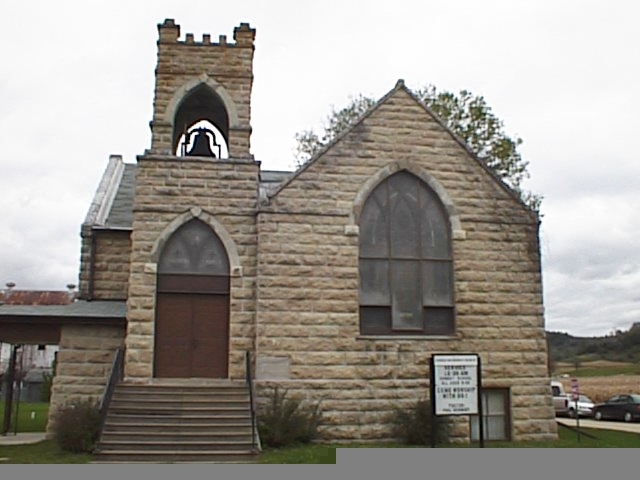 United Methodist Church-see photo at left.